Free U.S. Constitution Unit Study: Download a free U.S. Constitution Unit Study from Joy Christian School. This unit study includes a number of topics, such as Our Constitution Lapbook, Patriotic Music Lesson, History of the U.S. Flag, U.S. Presidents, United States Documents, and Branches of the Government. Learning Journey Toys on B1G1 50% Off Sale: Amazon has their Learning Joy Educational Toys on a B1G1 50% off sale. Match-it sets, puzzles, and educational games are all included in this sale. Free Copy of the U.S. Constitution: Order a free copy of the U.S. Constitution. This would be an excellent complement to the Constitution Unit Study. Free Braille Alphabet Card: The American Foundation for the Blind is offering free Braille alphabet cards. In addition to the alphabet card, the Braille Bug site offers a detailed explanation of the Braille system, including a biographical sketch on Louis Braille. Melissa & Doug Child-Safe Scissor Set for $4.53: Amazon has their Melissa & Doug Child Safe Scissor Set on sale for $4.53. This set includes a pair of straight-edged scissors as well as a pair of zig-zag edged scissors. While these scissors will cut paper, they will not cut hair or clothing. Free Spelling Course for Grades 6-8: Download Splashes from the River, a free spelling course for students in grades 6-8. 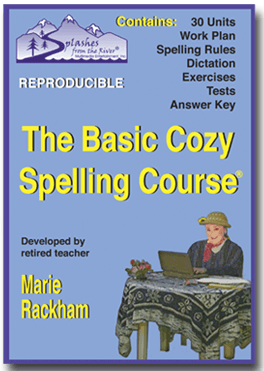 This course includes spelling rules, exercises, dictation activities, and answer keys. Melissa & Doug Shape Sorting Clock for $11.09: Pick up a Melissa & Doug Shape Sorting Clock for just $11.09. This toy fosters a knowledge of shapes, colors, and time. Over 300 Free Creative Writing Prompts: The Creative Writing Prompts website offers parents and teachers over 300 original ideas for writing assignments. Simply hover each number, and a writing prompt will pop up on the page. This site should help to cure any problems with writer’s block. Free Ebook Sampler from Teacher Created Resources: Teacher Created Resources is offering a free ebook sampler of their August Events Book. This resource includes studies on a number of topics, such as Christopher Columbus, Hawaii, and the history of the first cartoon. 20% off at Vision Forum: Vision Forum is offering customers 20% off their order with the promotional code BACKTOSCHOOL. This offer is valid through 8/17/12. Crayola Colored Oil Pastels (28 ct.) for $3.78: Amazon has their Crayola Oil Pastels on sale for $3.78. These jumbo-sized sticks are hexagonal in shape to prevent them from rolling off the table.